Crochet this cute little Christmas Pudding motif mandala doily in time for Christmas using simple crochet stitches and some fun glittery yarn with this week's free crochet pattern for Mandala Monday! 6 more sleeps lovelies! Eek! I'm not as prepared as I should be for the impeding festivities, but this sweet little Christmas Pudding doily certainly has me in the festive spirit! It has a 3D central Pudding motif and a pretty frilly edge.... great for Holiday tablescapes. Made using DK yarn and a 5mm crochet hook, it measures approx. 6 inches across and is perfect to whip up quickly as a last minute gift or Holiday decoration! There is a round using dc (US sc) into the back loops only but if you are new to this just take your time and you'll be fine! Also to change yarn colour, simply pull through the new colour as when completing a stitch and crochet over both ends to secure. Crochet terms in UK terms with US terminology in brackets below! Enjoy! R2: Ch3 as 1st tc. TC into the same st sp. (2tc) into each st sp to end. Join with ss. R3: Ch3 as 1st tc. Tc into same st sp. Tc ito next st sp. Repeat [ 2tc, tc] 6 times. 2tc into next st sp and change yarn to white as pull through last 2 loops of the 2nd tc. End with 2tc, tc. Join with ss and FO. R4: Join new yarn into the top of 2nd R3 SP-2 st.
Ch5 as 1st dc plus ch4, dc into same sp. Ch4, dc into same sp. FO. R5: Join new yarn into top loops only of 1st tc to the left of berries. (dtc, tc) into same sp. Miss 5 st and dc into the back loops only of 6th st.
Ch5, (tc, 2dtc) into the top loops of 4th st. Ch3. R6: Join new yarn into any ch-5 sp. (4tc) into same ch-5 sp. Repeat [ (5tc) into each ch-5 sp] to end. Join with ss and FO. R7: Join new yarn into any st sp. Ch3 as 1st tc. Tc into each st sp to end. R8: Join new yarn into any st sp. (2tc) into same st sp. Repeat [(3tc)] into each st sp to end. R9: Ch4 as 1st dc plus ch3. Repeat [dc, ch3] in every 3rd st sp to end. Join with ss and FO. R10: Join new yarn into any ch-3 sp. Ch1 as 1st dc. (2htc, dc) into the loop. Repeat [(dc, 2htc, dc)] into each ch-3 sp to end. 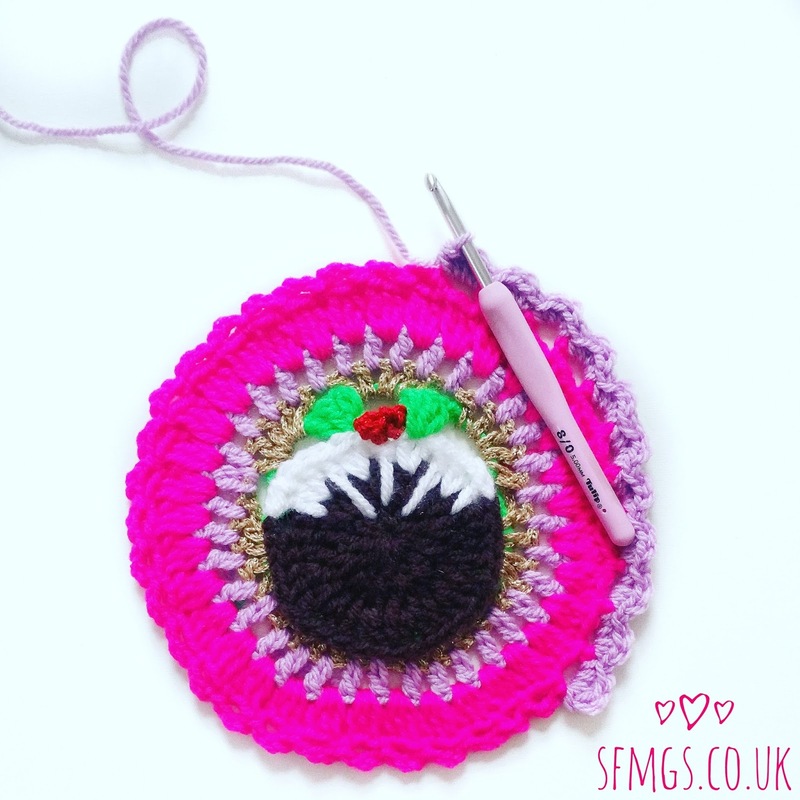 Show me your version on Instagram by tagging me @setfreemygypsys0ul or using the hashtags #SFMGS or #christmaspuddingdoily. And if you haven't got the bug for these yet... why not give one a try?! SOOO addictive!! 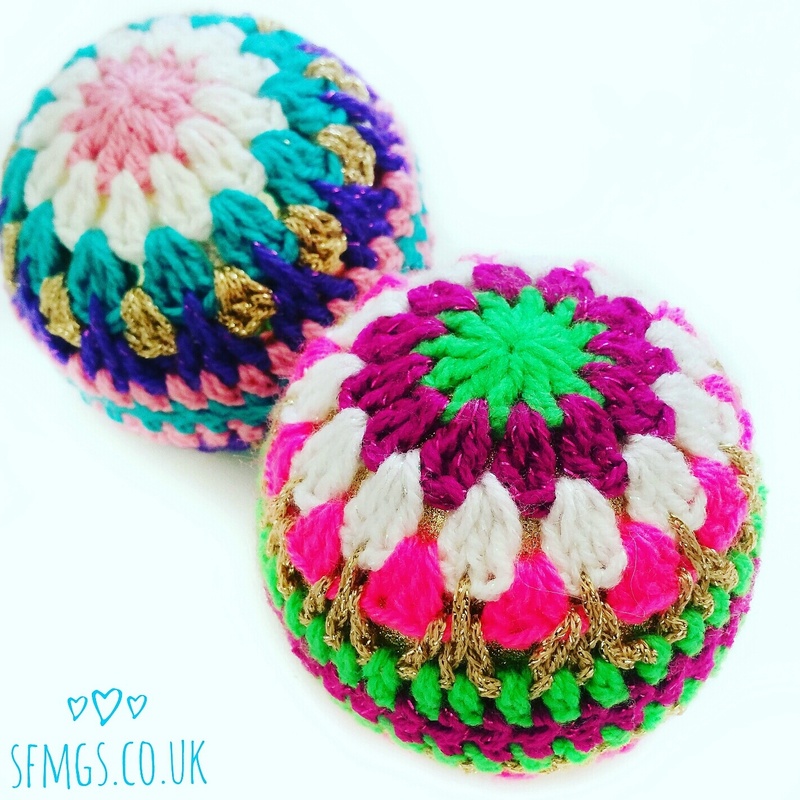 Get the free crochet Christmas bauble pattern I designed for +Hobbycraft by clicking here.